The Jiu Jitsu Laboratory’s feature focus on warming up for Brazilian Jiu Jitsu started with a look at your opinions on the warm-up and its effectiveness. Today we’ll begin examining the issues surrounding the warm-up in BJJ class – starting with the easiest: should you warm-up? It’s a clichéd observation that higher-belts will often skip the warm-up at their gym. They tend to wander in late, chat with a few people at the front, maybe do a short static stretching regime and begin with drilling technique when the white and blue belts have finished their warm-up exercises. In this scenario, who is going to perform better in drilling and rolling? When it comes to the technique portion, many people say that they feel their ability to learn and perform complex tasks – which are prevalent in Jiu Jitsu – is reduced. The general feeling seems to be that it’s harder to learn and perform techniques when you’re tired from the warm up, and there is some evidence in mice that muscular fatigue impairs learning. However, while there is contradictory evidence (as is usually the case in scientific literature), the majority of scientific research actually states that under most cases of moderate to hard exercise, cognitive performance is increased. Current models suggest that improvement in mental ability during or immediately following exercise is caused by increased arousal in the form of adrenaline, which helps your brain allocate more resources to cognitive performance. What this means to you and me is that when warming up for Jiu Jitsu, our mental ability is increased – unless we’re so fatigued that muscular failure is imminent, in which case our ability to think is impaired. It’s also been shown that this is the case regardless of fitness level. This is true not only following the warm-up, but during and after drilling technique too, since this phase of the Jiu Jitsu lesson can also be cardiovascularly demanding. What’s more is that over the long-term learning and cognitive function is improved by regular exercise. It’s often said anecdotally that a warm-up will focus the mind and help the athlete focus on the task at hand. This seems true after reviewing the available evidence – so long as carbohydrate and hydration levels are kept up. One of the few things that most sport scientists agree on is that it’s important to have some carbs and lots of fluid over long periods of exercise. When I hit up my Jiu Jitsu gym – I’m usually there for 2-3 classes spanning 3-4 hours. Without having some carbs over that time, both my mental and physical performance begins to wan. This isn’t an issue with warming up, per se, but you should definitely have some nice coconut water or a sports drink on the go – and drink liberally after your warm-up. Instructors that don’t let their students drink water during the class are not only assholes, but are actively impairing their students’ ability to learn and perform their Jiu Jitsu technique. While mental performance seems to be increased following the warm-up – what about physical performance? Of this list I was most interested in the effect of warming up on motor unit recruitment and haemolglobin release. To us non-sport scientists we’re talking about increasing your strength and cardio here. With a good warm-up that included repeated firing of a motor neuron, the amount of a signal that’s needed to contract the surrounding muscle fibers is reduced. This makes your body more efficient and increases your maximal output. Kind of like how you can lift a higher weight after progressive warm-up sets during weight training. Flexibility and risk of injury can also increased and decreased, respectively, by warming up – with several caveats. Notwithstanding Caleb from The Fightworks Podcast who blew his knee out during the warm-ups at his academy – warming up properly will make the muscles move more smoothly and efficiently. However, there is evidence in other sports that stretching – particularly proprioceptive neuromuscular facilitation (PNF) stretching – will reduce maximum output and explosive performance. Many sport scientists currently recommend brief periods of active, dynamic stretching following elevated body temperature prior to training, without static stretching. There isn’t much of a relationship between static and dynamic flexibility – and most sport-specific flexibility measures are dynamic in nature. 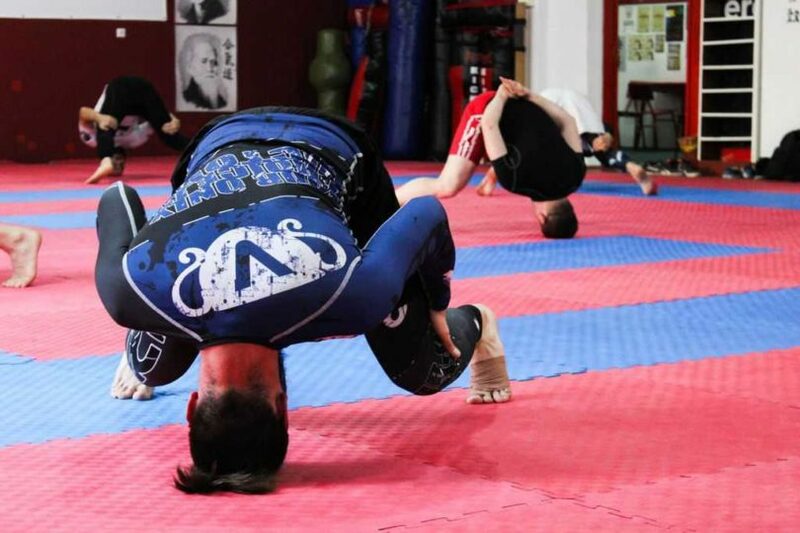 This is pretty different from some Jiu Jitsu classes I’ve been to, where groups of people are stretching out on the mats before class, or static stretching is built into the warm-up routine. So to answer our original question – yes, you should probably warm-up before Jiu Jitsu practice. The warm-up should be long enough to increase the body temperature and include motions that will facilitate cognitive function, maximal motor unit recruitment, oxygen utilization and dynamic flexibility. What these specific exercises and drills should be will be examined in future instalments of our focus on warming-up at the Jiu Jitsu Laboratory.